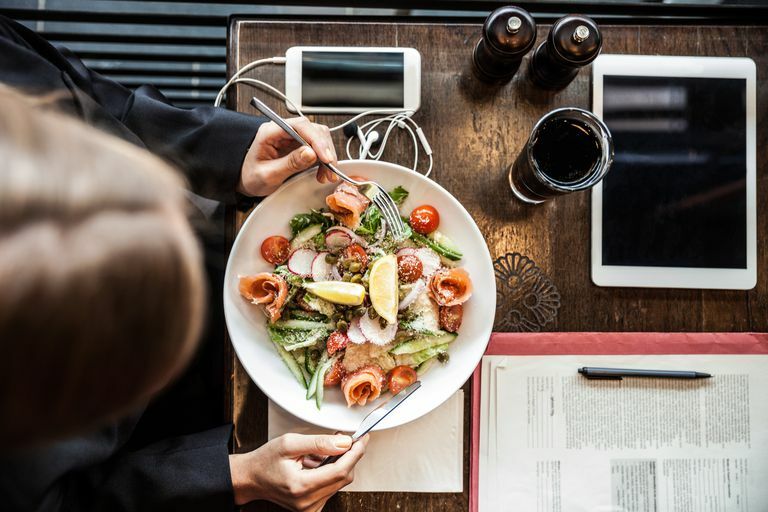 A healthy diet is one of the most important treatment approaches to managing polycystic ovary syndrome (PCOS), but that doesn’t mean women with the condition can’t go out to eat. The reality is, more meals are eaten outside the home than ever. American adults buy a meal or a snack from a restaurant 5.8 times per week on average, according to the National Restaurant Association. A big reason for this is because people are busier than ever and dining out is convenient, time-saving, and pleasurable. That being said, women with PCOS can enjoy going out to eat—they just need to be aware and careful with their selections. Eating at a restaurant doesn't have to sabotage your healthy diet for PCOS. Use these smart eating strategies to do it right. The plate method, a classic system well known by registered dietitian nutritionists, is a simple and handy way of having a balanced plate at meals to help with portion sizes. To properly do the plate method, follow the steps below to get a sense of what your balanced plate should look like. This can be helpful when you eat out at a restaurant or even if you are preparing your meals at home. 1. To begin, draw a large circle to represent your dinner or lunch plate. 2. Draw a line straight through the middle of your plate. 3. Starting on the right side, draw a line straight through the middle to separate it into two quarters. 4. On the left half of your plate, write "non-starchy vegetables." Non-starchy vegetables are vegetables that don’t contain many carbohydrates. Most vegetables are non-starchy. Examples of these vegetables are broccoli, spinach, zucchini, green beans, and Brussels sprouts. These foods should make up half your plate because they are rich in important nutrients and can help fill you up due to their rich fiber content. 5. In one of the open quarters write the word "protein." This is where your meat, fish and seafood, poultry, or soy foods go. A portion size here would be the size of your hand. 6. Lastly, in the remaining quarter write "whole grain starches." Whole grain starches tend to have more carbohydrates than other food groups. Women with PCOS can eat carbs, however, portion control can help to keep insulin and glucose levels in check. Examples of whole grain starches include brown rice, quinoa, and whole wheat pasta. Starchy vegetables like potatoes, corn, and peas, also fit in this category as do lentils and beans. A portion the size of your fist is a good way to estimate here. Here’s an example of what to order using the plate method: Grilled Salmon, brown rice, green beans almondine. Keeping the image of your plate in mind can help you plan your meals accordingly to have a more balanced and nutritious plate. Ah yes, that yummy basket of bread that comes to your table to tempt you before your meal arrives. There are several strategies to help you out if you tend to overindulge on bread before your meal. You could say no to the basket all together, this could be a wise choice if you plan to have a carb heavy meal. Perhaps have a satisfying salad or soup before your meal arrives. Or, you could limit yourself to a slice or two of bread (depending on the size) and enjoy it. Of course, avoiding going to the restaurant starving from the get-go will help. If you are very hungry, you will want more than just one slice. The Girl Scout motto applies to eating out too. If you know the restaurant in advance, take time to think about the food choices and what you plan to order. Many restaurants post their menus online. Think about what you would like to have with the plate method in mind. No vegetables included? Order them as a side dish or in place of chips or fries. Some restaurants will happily allow you to substitute a salad for fries. Restaurants have cleaver food descriptions for their entrees. In general, foods that are described on the menu as fried, breaded, crispy, creamy, crunchy or sautéed will usually contain more fat and more calories. Items described as baked, grilled, steamed, roasted or broiled tend to have fewer calories. If you have questions about an entree or want to make substitutions, by all means, ask your server. If you don’t want your vegetables covered in butter and salt, let them know. Want your fish grilled, not fried, speak up. Want more than just a small side of vegetables, ask them to double the portion size to fill your plate. Women with PCOS can enjoy alcohol, especially red wine which may help improve many aspects of the condition, however, cocktails tend to be full of juices and other sugary components which can quickly spike up glucose and insulin levels. If you’d like an alcoholic drink with your meal, stick with red wine. Other non-alcoholic drinks to enjoy include unsweetened hot or iced tea, coffee, seltzer or good old water. Enjoy your meal. Check in with yourself when you first sit down. Do some deep breathing. Ask yourself to rate how hungry you are from a scale of 1 to 10 (1 not hungry and 10 stuffed). Do this again in the middle of your meal. Practice recognizing when you are getting satisfied and stop eating. Our bodies do know how much food we need, we just have to listen to it. Eating slowly will help you enjoy each delicious bite. When satisfied, ask that your food be removed or wrapped up. Place your utensils down on your plate to signal to yourself and your server that you are done eating. You don’t have to finish everything on your plate. Know that you can enjoy the meal again soon at another time. Do you have a friend or partner who sabotages your healthy eating habits? Maybe he or she encourages you to order a not-so-healthy entrée, appetizer, or dessert? Have a game plan ahead of time to handle this. Consider talking to that person ahead of time of what your intentions are for the meal or perhaps picking a different restaurant will help. Would you like to see the dessert menu? Of course! Who doesn’t enjoy dessert? Women with PCOS can enjoy decadent desserts. The key is to eat it mindfully, using the tips above for during the meal. The same rules apply to dessert. Really taste and enjoy each bite mindfully. Are you noticing that you are getting too full? That’s a signal that it’s time to stop. Consider sharing a dessert if you only want a taste or two. Sometimes just a few bites will do the trick to finish off a delicious meal. Often times having a mint, or tea or coffee after your meal can also provide satisfaction with a meal. Here’s a tip we can learn from the Italians: take a walk (or fare una passeggiata as they say) after your meal. Not only will a short stroll help with digestion, but it can also lower your insulin and glucose levels that have risen from your meal. A study published in Diabetologia found that people with type 2 diabetes with who took a 10-minute walk after meals lowered their blood sugar levels more than exercising at other times of the day. With a little planning and choices, women with PCOS can enjoy dining at restaurants while maintaining a healthy food plan. Reynolds AN. Advice to walk after meals is more effective for lowering postprandial glycaemia in type 2 diabetes mellitus than advice that does not specify timing: a randomized crossover study. Diabetologia. Should You Freeze Your Eggs If You Have PCOS?